The Third World: Where Ends Meet — The Third World • Community driven and built by culture – Streetwear, sneakers, photography, music, art and lifestyle. We live in a culture where everything is always sugarcoated. We live in a society where not hurting a person's feelings is more important than helping them grow. We suppress what we can't express. We hide what shouldn't be kept inside. There is a thin line separating positive from delusional, and an even thinner line exists separating fact from fiction. The posters weren't made to be glamorous or classy because that's not what the Philippines is. We want to deliver a message that directly correlates with who and what we are as a country. Taking images that speak for themselves and are as real as it gets, then incorporating some creativity. The result? Pure artistry. It connects us even more as a community. We're all in the same ship. Music? Art? Fashion? These things have kept us sane in a time where negativity is a staple. The truth is, we're a third world country, and there's nothing wrong with that. However, there is something with sweeping that fact under the rug. Whether it be unknowingly or knowingly, that has to change. Be aware of your situation and from it, strive to learn, and to improve. Life will throw you more curveballs than it should but from overcoming it, comes growth. So stop living under a rock or in a box and just free your mind because you ALWAYS have a choice. The Third World tells it like it is. We shoot from the hip, you can take it or leave it. We don't always say what you want to hear but we always say what you NEED to hear. And what you need right now, is this event. A night of fun and artistry. Surrounding yourself with people who have the same passion, supporting the local community. Sounds pretty good to us. 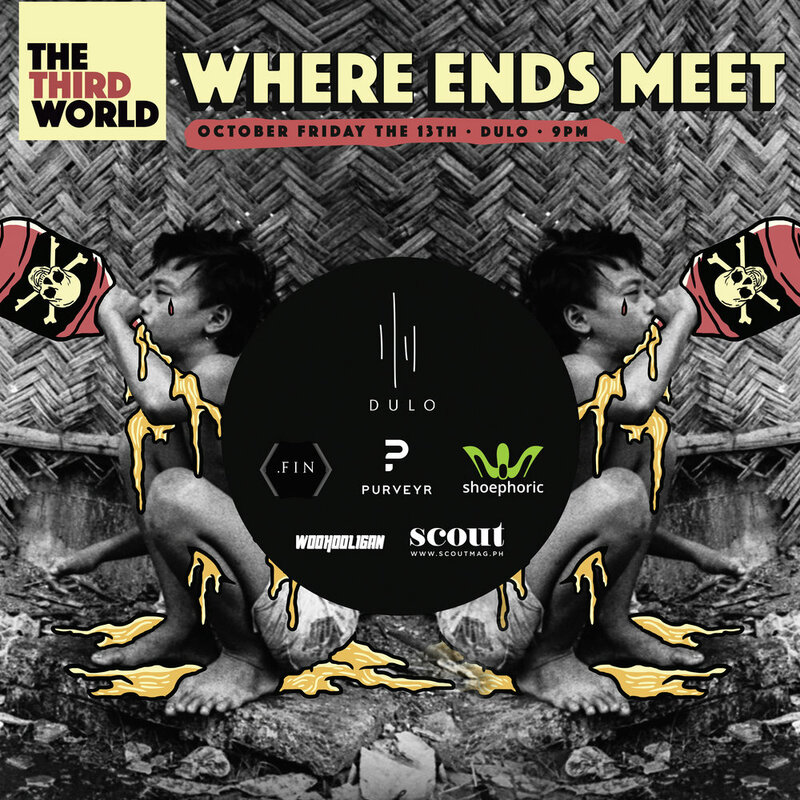 The Third World is a community which focuses on street culture, streetwear, music, and photography. We’ve been active since 2012, but changed the community name for a wider audience, since our main goal is to promote local talents who deserve recognition for their voice and works. We have finalized everything for an event to be held at Dulo MNL on October 13th (Friday), which starts from 9PM ONWARDS. There will be a 300 peso door charge which comes with a bottle of beer (Excluding media partners/brand owners/artists/DJs). We will also be printing a limited amount of event shirts, so all participating brand logos will be printed on the back. Shirts are limited to 25-30 pieces, and will be displayed at a rack and will be for sale (SRP 600) along with Garapata’s merchandise, shirts, and tote bag. 1st in line gets 3 freebies. 50th in line gets 2 freebies. 77th in line gets 1 freebie.